Inputs: Resources that are needed or used in the execution of a process step (raw materials, labor, information, etc.). ​Outputs: The results or outcomes that are created through the execution of a process or process step. The key to this requirement is understanding the transformational process that is performed by your business to create the product or service your company sells. Word of caution here: DO NOT GET TOO DETAILED when you are identifying the inputs and outputs. At a micro level, businesses can have hundreds of processes or steps and to identify the inputs and outputs of all those steps would be a monumental task. ​SIPOC diagrams are very easy to complete. Here are the steps you should follow to create your SIPOC Diagram and Identify the Inputs and Outputs of your organization. 1. Clear some wall space and assemble a cross function group (3 to 5 people are generally sufficient). Post some flip charts with headings (S-I-P-O-C) written on each, or headings written on post-it notes posted to a wall. ​2. Fill in the process steps vertically in the Process column (the "P"). If your organization was certified to previous versions of ISO 9001, you will already have a high level process map documented in your Quality Manual. Use this map as your process steps in the SIPOC. If you are starting new, describe what your organization does in 5 to 7 steps (roughly). An example manufacturer could be something like this: Quoting - Order Processing - Engineering - Outsourcing - Production - Shipping - Invoicing. 3. Identify the outputs of each process step. Once the process steps are in the center column, outputs are easily identified by asking the question, "what does this process step create?". Post those in the "O" column next to the associated step. ​4. Identify the inputs of each process step. Now ask the question - "what resources are needed to accomplish the process step?" and post those next to the appropriate step in the "I" column. ​Note: Following those steps to this point will give you a great start toward the understanding of your business' inputs and outputs. You can stop here if you'd like - but if you want to utilize the tool to its fullest, you take the following two steps and use that information to begin the formation of your list of interested parties. 5. Identify the customers that will receive the outputs. For each output, ask who the person, department, or entity is that will be receiving the output and list those in the "C" column. These customers could be internal or external to your organization. 6. Identify the suppliers of the inputs. Ask who provides each listed input and document those in the "S" column. Much like customers - suppliers can be internal or external to your organization. ISO 9001:2015 - 7.4 What is relevant internal and external communication? The second division of communication within a quality management system is external communication. This method of communication involves anyone pertinent outside the company; included would be other companies in the same field (service providers, maintenance providers), contractors, customers, stakeholders or board members. Devising effective external communication ensures all relevant interested parties are appropriately informed. (more on relevant interested parties - click here). a) What is communicated: ​Define and document the topic of communication - what is the information that is going to be delivered? e) Communicator; this is typically determined by the topic of communication - who is the person (or group) responsible for delivering the communication. Internal audits often provide the biggest problem for ISO certified organizations. Fundamentally nobody objects to internal audits, the goal is to optimize them but that can mean different things. Management usually recognizes that audits are supposed to review the way the organization is operating to ensure that processes are followed as expected, to ensure they are still achieving the goals set and to look for opportunities for improvement. However, when they don’t see audits reporting any problems or finding things to improve then the tendency is to move for cost reduction. How can we reduce the duration and the cost of the audit? Here is the thought, "If there are no findings then my processes must be excellent – I don’t need to audit them." Of course the problem is that the reason nothing was found and no improvements were suggested is because the audits themselves were not effective. Should every audit result in at least one nonconformity? No. The last thing you need is for audits to feel like a traffic cop walking around the facility writing tickets. Management must ensure that audits are effective and demand improvement. All processes can be improved and audits need to provide this for management. To get back to the original question of reducing the cost of audits - Costs can be significantly reduced by implementing improvement ideas resulting from internal audits - not by minimizing the audits. The first problem with internally resourced audits is that people typically don't want to do them. This is not what their career path is, this is not their chosen vocation and they know that when they get back to their day job nobody has done their work for them. This is not something to be desired, it is extra work to be avoided and minimized. The next problem is that these people are rarely adequately supported. They may have auditor training but because they do this once a year for a few days it’s easy to forget. It is difficult to remember the types of things they should be looking for, how to determine conformance, how to assess a process for effectiveness and with limited experience it is difficult to identify opportunities for improvement. Typically internally sourced auditors are cautious about what they say. They are unsure if a process is effective or not and tend not to say anything. Their findings normally focus on errors with procedures and occasional administrative improvements. 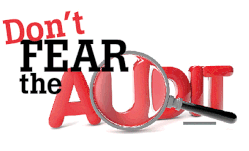 external auditor is finding things then you should question your approach to internal auditing. Outsourcing internal audits is the solution that more and more ISO certified organizations are moving to. Their recognize their internal people already have full-time jobs to do. They have difficulty maintaining adequate expertise and dedicating the necessary time to perform effective audits. Companies have outsourced functions with similar traits for years (accounting, legal, information technology, etc.) and now that thought process is moving its way to into the quality profession. As internal resources get busy, it just makes more and more sense to call on outside expertise. The outsourced internal auditors not only protect your certification but they are ISO experts. They maintain the necessary competence, have loads of experience and can bring best practices that your internal resources may not have thought of or been exposed to. They should be coaching, training and helping as they audit (good internal auditors are different from external auditors). They should be experienced enough to identify any issues in your ISO system and allow solutions before the external auditor gets there. They should have a wide ranging knowledge of organizations and subjectively advise about the effectiveness of your system and challenge for improvements. Management should again demand this of internal auditors irrespective of the fact that they are outsourced – it’s just that now the benefits of good internal audits can be realized. When you get right down to the numbers, in practice, outsourced audits are likely cheaper and add more value. Higher quality audits, more valuable suggestions and the development of a relationship with an outside expert that can help support the ongoing development of your management system - and with responses to third party and customer auditors in the event they find something. Add to that the missed hours of work, the distraction to an employee's "normal job" and costs of training, preparation, reporting and on-going communication and questions. Outsourcing makes so much sense. This does, of course, all rely on the fact that an outsourced auditor must be good. While simply being able to demonstrate effective audits is the ultimate test, someone with lots of auditing experience, ASQ and RABQSA qualifications, experience with consulting, qualified trainer and other ISO experience all indicate the ability of the auditor. The benefits are there to justify outsourcing your internal audits now. If you are considering the move to externally sourced internal audits - Click Here for more information and to get the process started! In this week's blog, we will dissect and better understand Clause 4.1.1. Of the ISO:9001 standard. This clause essentially changes the application and concept of clause 4. Context of the organization is a brand new requirement in this revision of ISO 9001, and your organization must now take into consideration both internal and external issues that can have an effect on strategic objectives and the planning of QMS. We now need to determine the context of our processes and procedures to comply with this clause. 1. Evaluate Your Organization. The first step is to look into your organization and evaluate processes, procedures, and context. Take time to evaluate all of the elements of your organization and their influences. Look at how they reflect on the management system. Take a look at your company's culture, flow of information and processes, company size, objectives, goals, complexity or simplicity of products, customers you serve, markets, the list can go on and on. You also will want to remember not to overlook the possible risks as well as possible opportunities regarding your company's business context. 2. Determine The Requirements. After you evaluate all aspects of your company, the next step is to determine which new requirements your company has already met in your existing documentation, and which are not yet met. If your company has already been using ISO 9001:2008, then you've already defined the scope of the management system and sequence of processes and interactions in your Quality Manual. Using these as an input to determine your context can save you time and prevents you from having to start from scratch! If you do have to start fresh and determine the scope of your management system, no big deal - the bulk of this task was done in Step 1 with your evaluation. Don't forget to determine and include your relevant interested parties. See last week's blog on for more information on relevant interested parties! 3. Document, Document, Document. After you've evaluated and determined your requirements, it's important to put pen to paper (or keyboard to monitor) and document your context. It is very helpful to document this context as a part of your scope within your Quality Manual. The standard does not specifically state that the context needs to be maintained as documented information, but it certainly helps with setting the strategic direction of the organization if the context is spelled out in black and white. If you take a step back, your context already exists, this process just helps you understand and firm it up. Think of it this way - if someone asked you what your company does and who it serves - what would you tell them? Think of what your response would be. That alone will give you a great jump-start to understanding your context. ​It's very important to understand the needs and expectations of interested parties in your ISO 9001 management system. Interested parties will have an impact on your organization’s ability to provide products and services that consistently meet customer needs as well as legal and regulatory requirements. This article will help you in understanding the needs of interested parties and continuously meet their expectations. An interested party is typically includes your customers, government or non-government organization, employees, owners or shareholders. You should know who your interested parties are for many reasons. To name a few, the management system scope needs to include the relevant interested parties' requirements, measurement traceability needs to be maintained- when this is an expectation of those interested parties, the quality policy is to be made available to relevant interested parties (when appropriate), and requirements for products and services may need to include requirements from relevant interested parties. ​So, how do you get started? Map Out External Interested Parties. You should continue your process of finding relevant interested parties by first looking at the customer. We may also have to include an end user, depending on the business. They have the biggest effect on our business in both a positive and negative way. There may also be government, legal, or regulatory parties that can have an impact on your business. Changes in legislation also come into play, and can have a major impact on your business. Banks, insurers and financial institutions will also need to be considered along with unions and your local community. The suppliers to your business and their performance will impact your ability to operate to plan so they need to be included, as well. Define the Power and Interest in the Relevant Interested Party. A vital tool in helping you determine who is a relevant interested party is to define how much interest they have in the decisions and activities in the organization. For example, a small business may have 1 or 2 decision makers and just be a phone call away from a decision, while a large corporation may require several weeks, several meetings and contracts before a decision is determined. It's important to determine how much power or influence they have over decisions, which could also be determined as their significance or risk. Plotting interested parties helps you to prioritize the effort required to meet their needs and expectations and set objectives and priorities. Communicate. Finally, part of the ethos of ISO 9001 is consistently striving for continual improvement. By identifying the risks and potential failures in the process, we can prevent them and continue to offer the best service possible. This ensures our relevant interested parties' needs and expectations aren't only continuously met, but we go above and beyond in making sure they have the best possible customer experience. Communication is key in unlocking the parties' needs and expectations. Where issues occur, we can learn from them. This prompts us to change the way we operate to ensure a better experience. ​Finally, make sure this exercise is not just a one time analysis. The needs and expectations of interested parties are fluid, so you need a way to ensure this review takes place on a frequency that makes sense for your business. ISO 9001:2015 - No More Quality Manual? ​The 2015 revision of ISO 9001 has removed the requirement of a Quality Manual, something that has been needed historically if your organization has wanted to achieve and maintain certification. This requirement appears no more! Woohoo! Shred those Quality Manuals and never look back! Right? If the standard doesn't say we need it, then we don't need it. One less document to maintain. Finally, life as an ISO 9001 certified company is getting easier! ​A common practice to create and maintain a Quality Manual for the ISO 9001:2008 standard (and earlier versions) was to create an exact copy of the verbiage in the standard, change all of the "shall" words with "will" or similar term that fits, change all references to "the organization" to the name of your company, slap a few logos on it, give it a control number and publish it. ​And then...nothing. Let it sit for years until the new standard is published and then repeat this copy-paste process all over again. That practice, although common, doesn't help anyone. Now is the perfect time to rethink the Quality Manual. Take a step back and really consider what a manual should do for your company - provide the framework for your entire management system. Here are a few ideas to get you started. Start thinking about the manual as something you can hand to a new employee that will help give them an introduction and overview as to how you do business - in plain English with the terms and acronyms that are used in your company - not in "standard speak". Build this manual within the framework of the standard but in a way where the general employee won't know it. Rename the Quality Manual. I don't know how many times I have heard a Quality Manager complain about their organization's culture viewing the management system as something separate from how business is done, as in, "the quality stuff is for the auditor". Start dissolving that problem today - change the name to Business Manual. Because that is what it is - a document that describes how you do business. And we all know, well executed business processes result ​in top notch quality. Keep that thing updated! Considering many Quality Manuals were nearly a carbon copy of the actual standard language it was understandable that Quality Manual revisions were uncommon as well. In order to make this Business Manual an ally, it needs to be current. Even if your ISO Certified Company has a thorough and accurate Manual for the previous year, it is still very important to keep this document up to date. Here are some things to watch out for that may trigger the need for an update. ​Significant changes to business structure or business processes. Keep in tune to changing reporting structures, new processes (manufacturing or service), acquisitions, partnerships, etc. Rules and Regulations. International rules and regulations are fluid, and it is vital to integrate such changes into business operations. Any change in an Industrial Standard, big or small, could necessitate a change for your employees, external providers, managers, or customers. Technology. Technology changes very fast and new systems are installed yearly, monthly, weekly, and sometimes even daily. Technology changes can come in various forms: hardware, software, machines, equipment, etc. Safety. Changes to the physical building structure, layout and environment happen as time goes on and ensuring the manual stays up to date with these changes will assist with the awareness of the safety rules and conditions to ensure a safe work environment. So, there are some things to think about. Even though the Quality Manual is not mandatory, it is still very much necessary. Use this opportunity to increase the role of the Manual within your business management system. ​Do you have a have an interesting way that you have made your manual more valuable? Please share in the comments below. ISO 9001:2015 - It's Official: Time to Throw Away all the Hard Copy "Controlled Document Books"! Now ISO 9001:2015 does not disallow the use of printed out, controlled hard copies of procedures, work instructions, and the like. Companies choosing to maintain hard copies of the "approved" documents at point of use or in other controlled locations certainly can keep doing that and your certification won't suffer. But, this is the 2015 version of the standard. Yes, 2015. It's time to simplify. There are tools out there now that will facilitate compliance with all of the 9001 Documented Information requirements in an electronic environment, and drastically improve the document revision and approval process. Facilitate, as in, make easier. My personal favorite is Microsoft SharePoint. Version control is a distinctive feature for any enterprise-scale document collaboration platform. In SharePoint, the versioning feature automatically saves every version of a document. This allows multiple people to make changes to a document without the fear of overwriting a previous version. An approval workflow feature is also available to simplify organization and sharing task responsibilities. The approval workflow routes items in a SharePoint site to specified people for approval. It manages and tracks all of the human tasks involved with the process and provides a record of the process when it completes. Approval workflows support any business process that requires sending documents or items to colleagues or managers for approval. The check in - check out feature allows you to make changes to a file on a site, and ensures no one else can edit the file. When you have the file checked out, you can edit it online or offline and save it as frequently as needed. You can simply check out, check in, and discard changes you make to files in SharePoint libraries. User permissions can allow users to specify who can view drafts and edit content on any document. This feature allows users to manage and assign documents to specific individuals without having to make all documents public within SharePoint. ​Don't wait another minute. Start exploring this now. ​There are so many benefits to moving from a paper based document control system to one that utilizes SharePoint that I would have to post another blog (or 2) to adequately describe them all. Making this leap will save you so much time, and it does not take too long to convert. If you would like a nudge to get started, shoot us an email, or post a comment below. We'd love to help you out! Healthcare Data Analyzers: Guess What Day It IS?! If you read the title and had a flashback to the Geico commercial with the camel wandering around the office - I hope it put a smile on your face. If you have no idea what I am talking about - you might want to check it out here. Ok, so I am not writing about camels or insurance. But I AM writing about "what day it is". Have you ever had a spreadsheet with data that included dates and someone (maybe you) was wondering what day of the week each date corresponded to? As I am sure you know, in healthcare, day of the week matters. There may be different arrival patterns in the ED, there might be different staff scheduled in the birthing unit, There might be...I think you get the idea. Saturdays are not the same as Tuesdays. Excel has a formula to extract the day of the week from a date field that assigns number values to the day of the week depending on which criteria you enter (Monday = 1, Tuesday = 2, and so on). This is helpful, except it leaves people asking, "what day is it?" - as in - "are the 1's Mondays or Sundays?" I've got a simple way to bring the names of the days into your spreadsheet so that no one is left trying to decode your data. i.e. Monday = Monday, Tuesday = Tuesday...easy, right?